Nintendo's announced that it plans to release the Nintendo 3DS, the handheld that will "succeed" the current DS before March next year. The announcement was made in a newly released investor report, which says, "...games can be enjoyed with 3D effects without the need for any special glasses." - Pretty massive. The report also says that the 3DS will succeed the DS Series and will support backwards compatibility for DS and DSi software. "Nintendo Co., Ltd.(Minami-ward of Kyoto-city, President Satoru Iwata) will launch "Nintendo 3DS"(temp) during the fiscal year ending March 2011, on which games can be enjoyed with 3D effects without the need for any special glasses. We are planning to announce additional details at E3 show, which is scheduled to be held from June 15, 2010 at Los Angeles in the U.S."
Nintendo makes pop up books. I certainly hoped Nintendo paid Johnny Chung Lee for the rights to use his creation. Nintendo Says 3DS Is "Our Next Handheld Platform"
Dispelling any doubt over the significance of the upcoming 3DS, Nintendo of America president Reggie Fils-Aime has told BusinessWeek that the console is the company's "next handheld platform". "We have ideas of what we want to bring to the consumer that we can't do with the current DS model", he said. "The Nintendo 3DS for us is our next handheld platform." While this seemed likely given the fact that DS support for the 3DS has been described as "backwards compatability", this is the first official confirmation we've had that the 3DS will indeed be an all-new handheld generation, making it Nintendo's fourth after the Game Boy, Game Boy Advance and Nintendo DS. The world will get its first look at the 3DS in June, during the Electronic Entertainment Expo in Los Angeles. And features user-adjustable 3D intensity, according to "sources"
The Nintendo 3DS is expected to be considerably more powerful than the current DS, but a new report cites "sources" claiming its visual are close to that of HD consoles like PS3 and 360. "Several developers that have experienced 3DS in its current form have reported, off the record, that it has processing capabilities that far exceed the Nintendo Wii and bring the device with abilities that are close to HD consoles such as PlayStation 3 and Xbox 360," says IGN. Later in the feature it goes to say: "Off the record sources indicate that the system will have user control over the 3D effect to make it more or less intense." That would be similar to nVidia's 3D Vision kit for PC, which also allows you to toggle the intensity if 3D yourself to suit your eyes. The Nintendo 3D is Nintendo's next handheld device, supports 3D effects without the need for glasses and will be out in Japan before April 2011. That's the official word. Nintendo will show off the console for the first time at E3 next week. The Nintendo 3DS will have a 3D camera, two differently-designed screens, a tilt sensor and will be significantly more powerful than current handhelds, according to our reporting. A sketch of the 3DS by a Chinese blogger who claims to have a 3DS development kit matches other reports and information Kotaku has heard from people familiar with Nintendo's next handheld. All together they form what is Kotaku's best guess of what Nintendo's next major gaming device will offer players. The sketch presents a 3DS that shares the clamshell two-screen design of the original 2004 DS, an expected set-up given that Nintendo has confirmed that the 3DS will play DS games. But the new 3DS sports a bigger top screen, presumably a Sharp-manufactured display capable of showing game graphics in screen-popping 3D. The 3DS' lower screen is built to the specifications of the original DS' lower touchscreen. 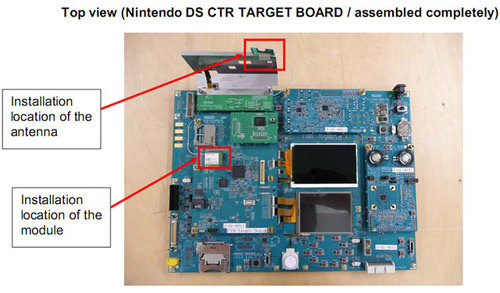 These screen ratios match those seen in a DS circuit board filed by Nintendo to the FCC. In his report, the Chinese blogger says that "the effect of the [3D] screen is amazing." The blogger mentions some features, including an MP3/AAC hardware decode function and a media player of some sort. Reached for comment about these features, Nintendo of America provided a statement that " Nintendo does not comment on rumors and speculation." Kotaku contacted Sharp as well but did not hear back by press time. But the numerous details out there remind us that in this era of lost iPhones, company hardware secrets are harder to keep than ever. As official announcements loom, details tend to trickle out, as they did here about the Xbox 360 on Kotaku in 2005. The Chinese sketch strengthens our belief that the 3DS will include cameras, as do the DSi and DSiXL variants of the DS product line. A rectangle near the d-pad of the 3DS in the sketch could represent the Sharp-designed 3D camera that was rumored last month to be on its way to the new Nintendo handheld. Such a camera might be used to capture images in 3D dimensions or detect motions of the player. In the future, Sharp will be opening up new 3D markets based on 3D display technologies, including small/medium-size and large-size 3D LCDs, as well as on 3D input device technologies such as 3D camera modules. The Nintendo 3DS, we're told, will use a second, proprietary medium for games specific to the portable. We understand that the new 3DS games will fit on a card about the size of a Compact Flash card and that the system is designed to accept both these new games and DS games, possibly in the same slot. We don't believe the 3DS will include an analog stick, leaving character control to the machine's d-pad and/or touch screen. We do expect the 3DS to have a tilt sensor or accelerometer of some sort, a fact that was all but confirmed by Nintendo president Satoru Iwata himself despite the company's attempt to distance themselves from the statement after it was published in a major Japanese newspaper. The official specs for the 3DS will be revealed on Tuesday during Nintendo's E3 media briefing. Reports about the machine's horsepower, rumored earlier this week to be in the league of the Xbox 360 and PlayStation 3 may be an overstatement, but game industry sources familiar with the project have acknowledged to Kotaku that the system is an extremely capable device. It may be as powerful as a Wii. Buzz on the system has been unusually strong of late. Earlier this week, EA boss John Riccitiello was quoted in the gaming press saying that he had seen the 3DS and that "it's cool." While that type of praise might be easily dismissed as pre-E3 hype, Riccitiello's general praise for the 3DS has been echoed by multiple enthusiastic gaming industry sources in touch with Kotaku. They won't reveal what the machine can do, but they attest that Nintendo has something special in the works. That's a different kind of buzz than the one that preceded the DS six years ago, a machine that was preceded by skepticism by many game creators, confusion about the device's features and an underwhelmed impression of the system's power when compared to it's looming rival, the PlayStation Portable. Six years later, it appears that Nintendo's next handheld hardware is closer to the cutting edge, more impressive than odd. E3 2010 was expected to be the Xbox 360 Project Natal and PlayStation 3 Move resurgence of motion control gaming. But the 3DS, with a surprise packed in, just might steal the show. Please note: The image atop this post is a mock-up based on our best assessment of which features will be in the Nintendo's 3DS. Kid Icarus' long awaited return was revealed today by Nintendo; he will star in Kid Icarus Uprising a title designed specifically for the new Nintendo 3DS. In the the debut trailer, Pit appeared with a cheery, "Sorry to keep you waiting," as the familiar Kid Icarus theme soared over the gameplay sequences. Kid Icarus' debut was in the 1986 release for Famicom and later the Nintendo Entertainment System in North America. I'll buy it for that alone. European 3DS launch "by early next year"
A senior source close to Nintendo has claimed that 3DS will be available worldwide "by early next year" at the latest, with a 2010 launch in at least one territory "likely". Nintendo conspicuously avoided detailing launch plans for its 3D handheld during Tuesday's E3 conference, where the system was unveiled. Speaking to Eurogamer after the event, a Nintendo UK spokesperson confirmed that the company had no announcement to make on launch date or price at present. But our source revealed that a holiday 2010 release is being worked towards on a global level, with a chance the system could slip into early 2011. The console, which produces 3D visuals without the need for specialised eyewear, has been met with widespread acclaim, and its E3 debut is backed by a wealth of demo content produced both in-house and from key third-party partners, including playable games, interactive videos, 3D movie samples and the ability to take 3D photos.